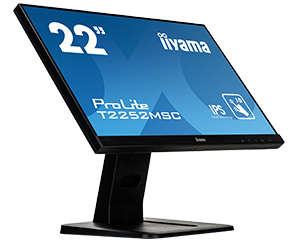 With its Full HD (1920x1080) resolution and accurate Projective Capacitive 10 point touch technology, the ProLite T2252MSC-B1 delivers seamless and accurate touch response. Featuring IPS LCD screen technology, it offers exceptional colour performance and wide viewing angels, making it a perfect choice for a vast array of interactive applications. The flexible stand can be positioned at several angels creating a comfortable and ergonomic user experience. In addition, the edge-to-edge glass and ultra slim design creates an eye-catching finish with high contrast guaranteeing perfect clarity and brilliant colours. The ProLite T2252MSC-B1 is the ideal solution for interactive signage, instore retail, POS and interactive presentations. As we all know looking at a monitor screen for several hours per day, especially form a closer distance, causes eye fatigue. This effect is much stronger with computer screens than with TV equipment. One of the factors responsible for this phenomenon is the blue light emitted by the screen. Therefore reducing the amount of blue light ultimately allows our eyes to feel less tired while working long hours with a computer screen. We achieved it by adjusting the monitor's brightness and color temperature through a new feature called â€œBlue light reductionâ€ easily accessible through the monitorâ€™s OSD menu.